It has a reclining range of 50 degrees - from 90° to 140° - via quick adjust handles. The 16" and 18" options have a 300 lb. weight capacity 350 lbs 20", 22". New state-of-the-art hydraulic reclining mechanism allows for infinite adjustments up to 180 degrees. Elevating leg rests and anti-tippers are included as standard options. 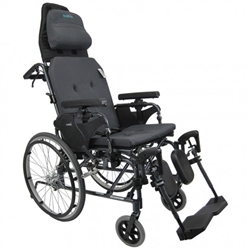 Full 180° reclining range and padded, detachable armrests with side panels. State-of-the-art hydraulic reclining mechanism allows infinite adjustments up to 180°. 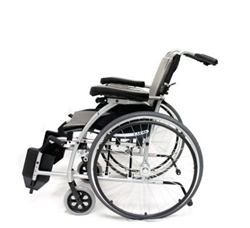 With full length padded armrests, an adjustable height head pillow, and more this wheelchair has added comfort for any user. This chair also features swing-away elevating footrests and adjustable length leg. 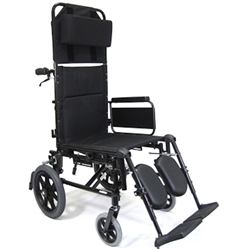 Instead of offering the manufactures options and upgrades at additional costs, we're going to configure the chair for you with ergonomic 2" foam seat cushion, back cushion and padded headrest. 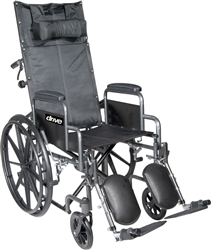 Recliner Wheelchairs have a key feature that allows for adjustment of the backrest and/or footrest into a reclined position. This is a very important feature, especially for those who find it difficult to sit in an upright position or for those who wish to sleep in their wheelchairs.